First, you’ll have to forgive my camera phone images. From now on, I’ll use my actual 7MP camera. I do, however, love how I can auto-upload the pictures along with captions and keywords directly from my phone via Pixelpipe (thanks Android Marketplace! ), so you may just have to endure a mix of the two. Gyro World in the Factoria Mall is a gem of a restaurant. With a dozen or so tables that always seem to be packed at lunch time, it’s one of the few restaurants still active in the mall. With Orange Julius and a pizza place along with Chinese food and a Thai restaurant going out of business, it’s nice to know you can get your shoes repaired next door or shop at Target before or after grabbing a quick bite of really tasty, albeit from a somewhat limited menu, Greek fare. 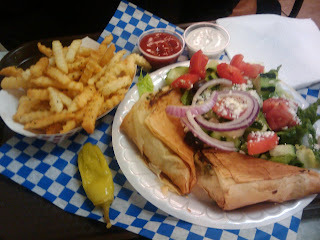 The Spanikopita Plate with a side of the Greek seasoned fries (along with sides of ketchup and tzatziki) is Carrie's usual order. She loves it and has ordered it consistently over the past several years. Who knew mall food could be this flavorful? My usual choice waffles between the Super Traditional Gyro and the same thing but with chicken, though I did spice things up by adding their side of hummus this time. 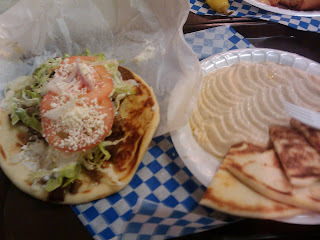 They do offer whole wheat pitas (which, for some reason, I always forget to substitute). The meat is a bit crispy, very tender and juicy, and never fails to hit the spot. Their hummus has a strong tahini flavor, as it should, but doesn’t deliver in terms of the garlic twang I’ve come to look for. Overall, the meal is inexpensive and definitely worth stopping by, even if you use Old Navy or DSW shoe shopping as the main excuse to get you into Factoria Mall. great review..for the first time in my life I might have an excuse to check out Factoria mall. What phone did you use? Its been awhile since I've eaten there. A few days ago I ate a new Gyro restaurant.. can't remember the name of it.. but its in the Northgate Village where TJ Maxx is.. and I was really impressed by the meat portion. There was a ton of it! After 'gotten origin' pearltrees.com/ opportunity on your Know More android tool, by-using this software application, Download Game Killer APK for PC, Android, iPhone Free you can quickly modify Game Killer Download 'HP, MP, Lives', and so forth. You can 'Follow listed below given actions' Game Killer obtain Game awesome. Both models are fantastic, sitey.me/ as well as costly; the Revolution Flex runs See More Tips concerning and also the Ironman as well as SUS will certainly Top Best Convertible Car Seat Reviews in the year 2016-- 2017 set you back.